True confessions! I haven’t been totally excited about most of June’s recipes for French Fridays with Dorie. 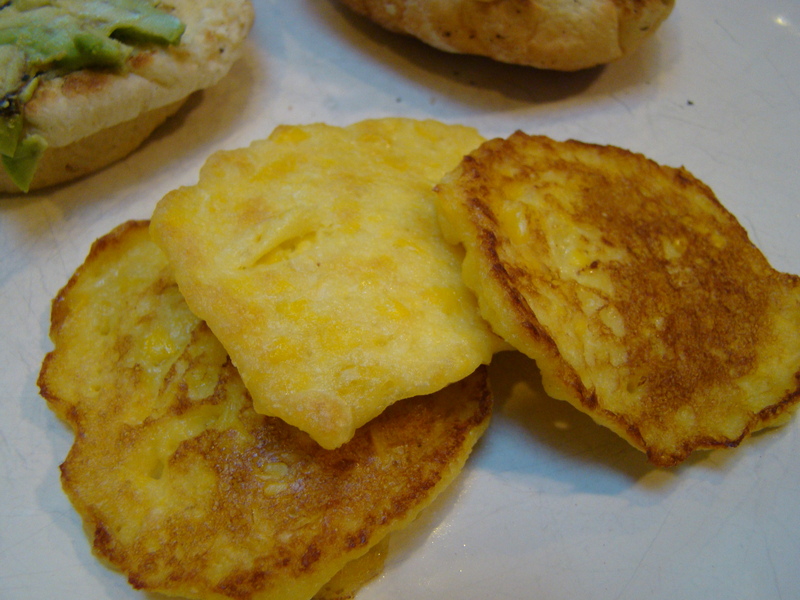 When I reviewed the list, I was completely uninspired by June’s finale, Corn Pancakes. I’ll admit that I like, but do not love, corn. When I read the recipe and saw that it called for canned corn, my ambivalence dropped a notch. We are on the cusp of local corn season, after all, not mid-winter. However, I’m in this group for the long haul, so I felt compelled to play along. I’ll be the first to admit that I very wrong about this one! Fresh corn from the south is available in stores, so I couldn’t do the canned corn. I wasn’t sure how much to substitute, but two ears, cooked, and then stripped of their kernels, yielded just under two cups, which seemed about the same as a one pound can. There weren’t many ingredients, just the corn, eggs, a bit of flour, and salt. 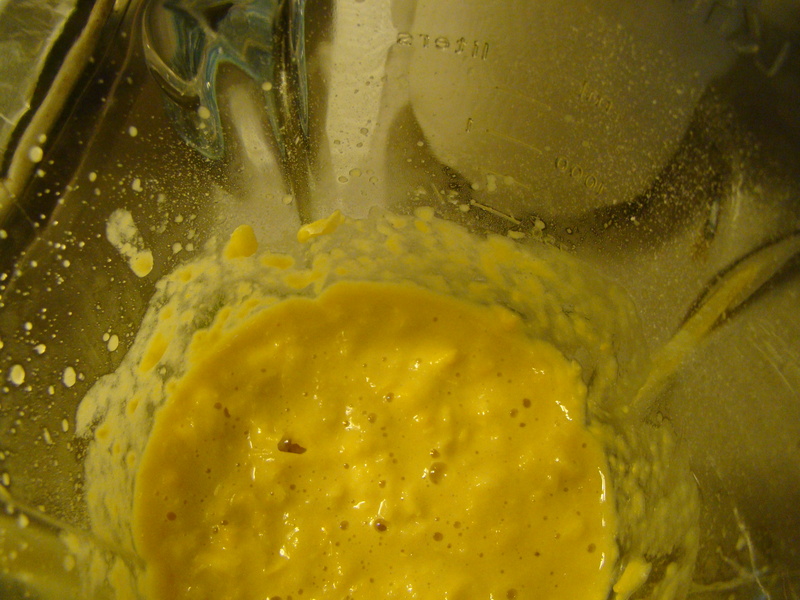 The batter was a snap to mix up in the blender. Then, the pancakes cooked in hot oil for just a few minutes. I got about 18 little silver-dollar pancakes. The first night, we each had a few to accompany burgers. 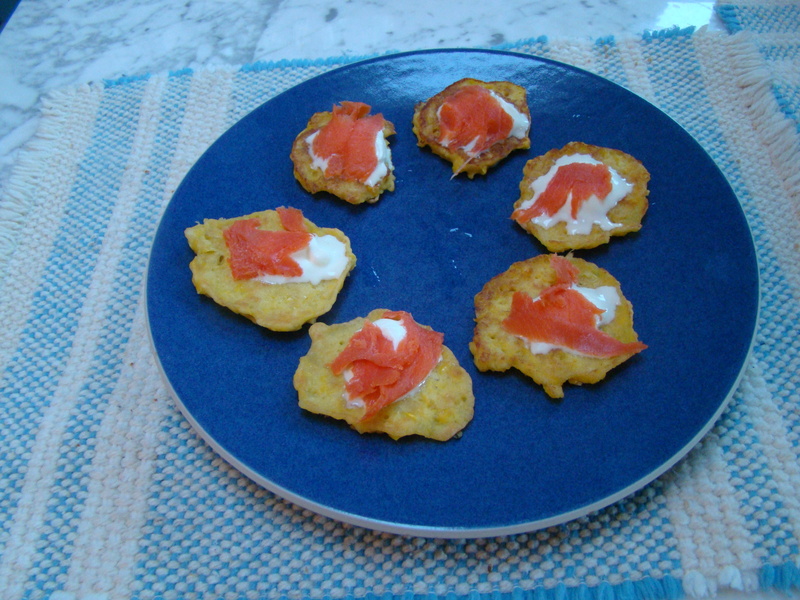 Even better were the leftovers, reheated and topped with a dollop of crème fraîche and a piece of smoked salmon, the way that Jean-Georges Vongerichten served these for Dorie. In the end, I really liked these and would definitely make them again, more likely as an appetizer served the “Jean-Georges” way. 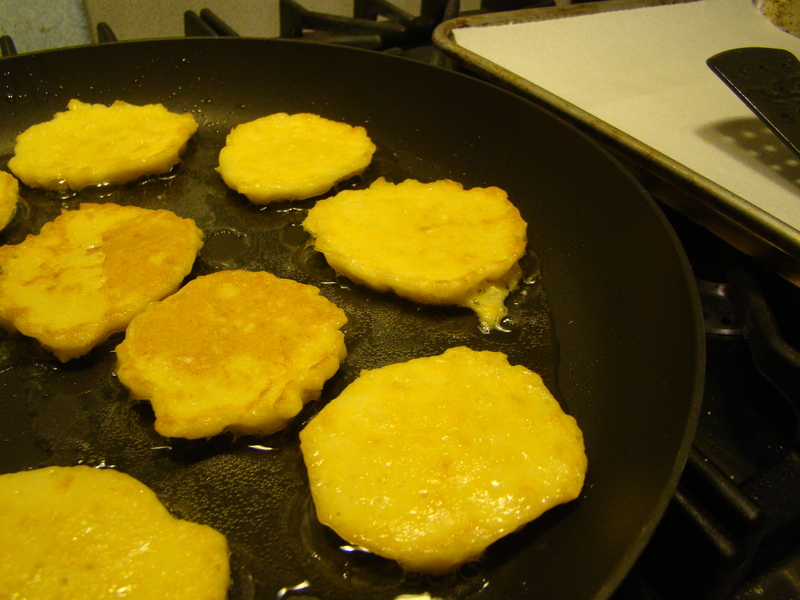 If you want to see what the other bloggers thought about their corn pancakes, follow the links posted under the Leave Your Link post for Corn Pancakes. We don’t publish the recipes, but consider getting your own copy of the book, Dorie Greenspan’s book Around My French Table. Posted on 29 June 2012, in French Fridays with Dorie, Summer and tagged corn, French Fridays with Dorie. Bookmark the permalink. 18 Comments. They look great with the salmon! Glad these were a hit for you :-) Love the salmon on top. Yours look great. I’m glad you were pleasantly surprised!! I used canned corn (I’m picking up the first farm picked corn of the season on Saturday) and I was completely underwhelmed. I’m sure yours were good with the salmon and cream. They look tasty. But I know that you did the right thing by using fresh!!! I think they´re better with fresh or frozen corn. I froze some and am glad that you liked the leftovers better, since I will have to do the same. The salmon ones look great. Have a good weekend! What a great little appetizer! :) I served these with a big salad and that was perfect for dinner! Good to hear these are a keeper for you! Betsy, I agree, salmon as a topping or just plain was the way to go here – we loved them too and I appreciated the easy recipe and the fact that they “cooked/browned” so nicely. I meant to ask you how the beekeeping is going. Hope all is well – I really have no idea how long it actually takes for the first honey – the whole experience must be wonderful! I may have to try these the “Jean-Georges” way – they look wonderful! How funny, Betsy – I felt exactly the same way about this recipe starting out. I guess it’s easy to surpass your expectations when they’re low to begin with – LOL! You did a great job with the toppings. Betsy, This was the pick I knew I would like…I love corn! 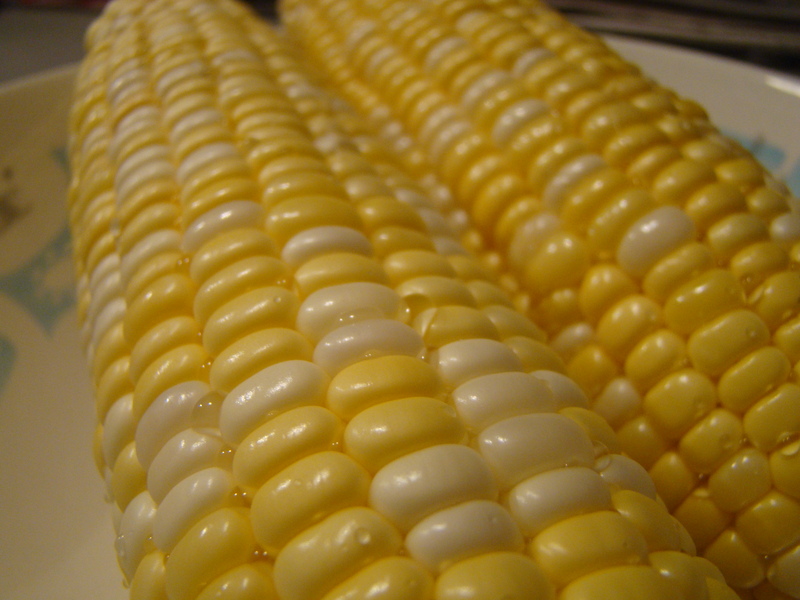 Your’s look so delicious and I love that you used fresh corn! I will be making these again as soon as Jersey corn becomes available. So glad you enjoyed them! Have a great weekend! I really liked these little guys too! Weirdly I’m more apprehensive about July’s recipes than I was about June’s! Hi there. I am from the south too but ran out of time or I would have made mine from fresh corn. I love that photo up there of the fresh corn. Your pancakes look delish. Not a bad recipe overall. I made this weeks ginger picles today. They aren’t bad either, tasty actually. We made these and liked them. I am trying to cook my way through AMFT by myself. I will have to try them with fresh corn too.